So you’ve set up a new company or are looking to recreate your brand image? The current competitive business environment is likely to make this task extremely difficult for you. Though there are various opportunities to get connected with your prospects and consumers, you just have to find the right platform and techniques to get your message out there. Build on an effective and easy email marketing campaign to turn your business operations, products, services, and offerings into gripping content that your prospects can’t simply avoid noticing. So someone has recently subscribed to your newsletter or information leaflet? Now what? You, like any other business, would certainly send a welcome email to this new subscriber, wouldn’t you? It’s time to revise this approach. Explore a few effective alternatives to make this first contact more meaningful, interesting, and engaging. This is your ultimate opportunity to turn a prospect into a permanent customer. Use a variety of innovative elements to provide your subscribers with the content they find exciting and useful. Any regular yet successful email marketing program may work like this: ask for birth date, design an email with a special greeting, include an offer, trigger the recipient, and enjoy good results. Want to give this approach your own special touch? Personalize this marketing style with unique content and strategies. You can include the recipient’s wish list, recently browsed products, and a few recommendations in a birthday email. Such personalized emails usually go a long way and bring you better results. Think birthday emails are too mainstream? Celebrate “purchase anniversaries” to trigger happy memories for your consumers! Good Friday, Easter, Christmas, Thanksgiving Day, Hanukkah, or Independence Day, regardless of the event or festival, email marketing campaign is a good way to convince more people to make purchases. You can send them gift guides, gift wrapping tips, or themed promotional items to make their celebrations simply unforgettable. This will strengthen your brand image and bring you additional traffic, better sales, and of course, greater profits. Successful email marketing campaigns usually make inspirational stories a vital part of their email messages. After all, many people enjoy reading the success stories they can relate to. It may help to highlight the humane side of your business. So personalize your email message to maintain that personal connection with your existing and potential customers. Have launched a new, unique product? Have achieved a crucial milestone? Have something exciting that you want to share with your consumers? Don’t hesitate and get your message around. A successful email marketing campaign makes it easy for consumers to relate to the business’s offerings and services. 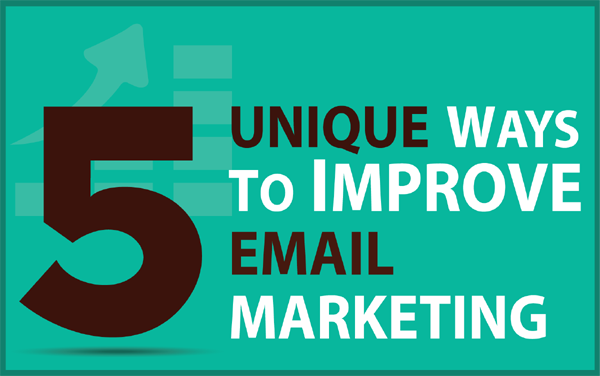 There are virtually unlimited techniques to improve email marketing campaigns. You can find exciting content for your email message quite easily – just make sure you’re looking at the right place.